While I believe everyone in the world should see the light and go Vegan, I have a list of certain celebrity chefs that I especially wish would turn their talents to cruelty-free cooking. Heading that list is Rachael Ray. I have to admit I have a special place in my heart for Rachael. It’s because of her that I learned to cook at all. Quero dizer, I knew how to make some dishes from watching my mother cook but I had no clue about cooking techniques, chopping, temperos, o “por que” de cozedura, or how to create recipes. As I’ve mentioned in “Meu Vegan Journey,” before I found Veganism I hurt my back and was laid up on the couch in pain. It was a particularly bad time: I’d lost family members, lost Poochie to cancer, couldn’t go to work and I was in tremendous pain. I’d lay on the couch, depressed, watching television. I had just started Vigilantes do Peso (novamente) and maybe because I couldn’t eat what I wanted, I started watching food shows on TV. 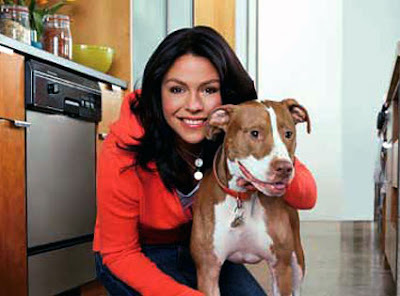 And I found Rachael Ray. I loved her! Her manic personality, her sarcasm, her corny jokes, her humble “Eu não sou um chef, I’m just a cook” attitude (granted, this was the old Rachael; she’s not as manic or as humble anymore). She dropped food, she talked with her hands, she burned the bread, she made up words and she had fun cooking! In her, I saw my own personality when not bombarded with troubles. Watching her on “30 Minute Meals” perked me up, made me laugh and most importantly, made me want to cook. I bought her cookbooks and when I was able to stand up, went into the kitchen and attempted to make her recipes – but with a Weight Watchers spin. 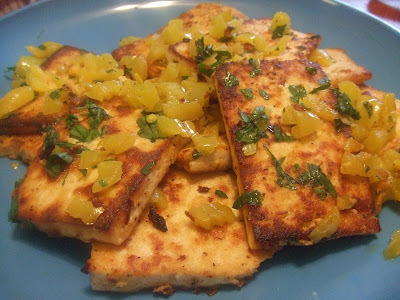 When I went vegetarian and then Vegan, I continued to make Rachael’s recipes but Veganized. That wasn’t hard since out of all the non-veg cooking shows I’ve seen up to now, no one prepares dishes with as many vegetables as Rachael does. But as I was sorting out my new Vegan identity, I avoided non-veg cooking shows especially Rachael’s. It upset me to see her cooking animal products. It angered me to hear her proclaim to be an “animal lover” when she really just meant dogs and cats. It frustrated me to no end when she would make vegetarian dishes and then put chicken stock in them! I felt as if she had personally disappointed me by not evolving along with me and that I had lost someone I truly admired. Over time though, as I became more secure in my Vegan identity, I was able to put Rachael in her rightful place: she is one of my favorite celebrity chefs who taught me how to cook (sim, I can recite all her tips, catch-phrases and neologisms, much to the annoyance of others) and helped me get through a really painful time in my life. For that, I’ll always be grateful. And while Rachael may never make that connection between her dog and her food, she still creates recipes that I love to Veganize. This is one of those recipes. 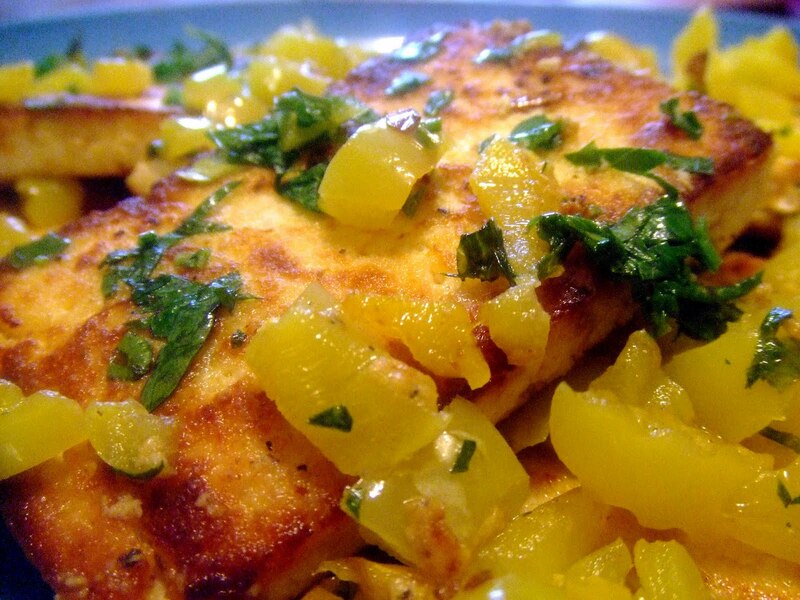 The other day Rachael made a pan-roasted chicken dish that she covered with banana peppers. I love the mildly spicy taste of banana peppers and thought “Ei, I could do that with tofu.” Not having the schmaltz from the chicken meant creating a sauce with some other ingredients but that just made the Vegan makeover more fun (and made my arteries happier). 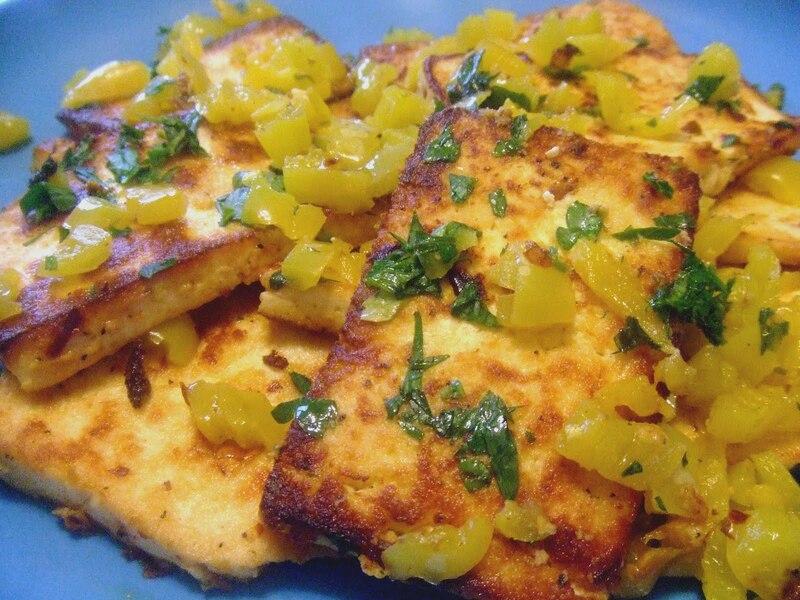 The result is my Tofu in Spicy Pepper Sauce – a quick and easy dish of crispy tofu covered in a spicy sauce, topped with banana peppers and parsley. It’s gluten-free, zingy and delish! Rachael does make a lot of vegetarian and some Vegan dishes on her show. Today for the first time, she talked about tofu AND tempeh! Maybe there’s hope…in the meantime, there’s my version of her recipes. And if I do say so myself, they are YUM-O! 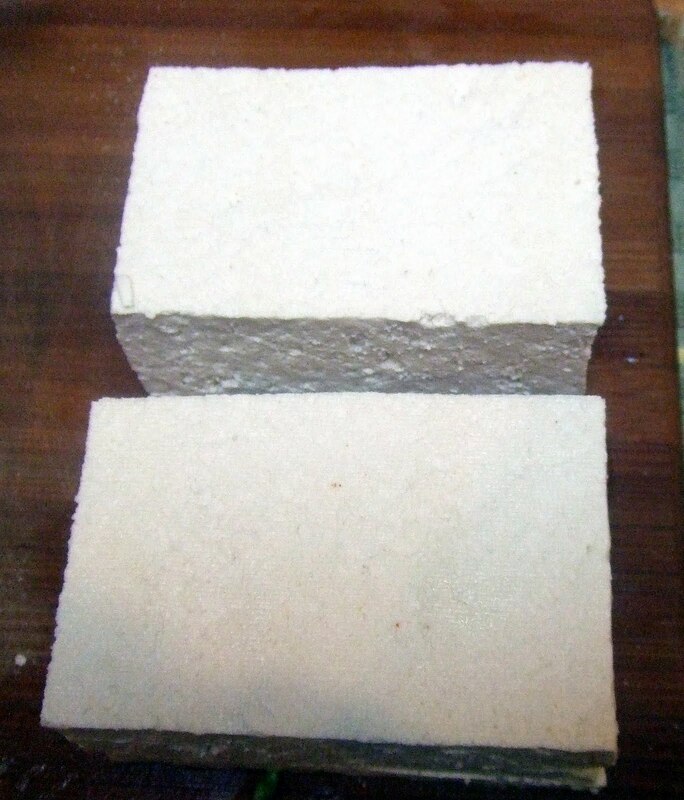 Corte o tofu em 8 fatias. I do this by cutting the block of tofu in half width-wise. Then I slice each half into 4 fatias retangulares finas. Em uma tigela, combine the mustard, néctar de agave, flocos de pimenta vermelha, óleo, sal e pimenta. Misture bem. Cover both sides of each of the tofu slices with the marinade and let sit for at least 30 atas. Heat the canola oil in a large skillet over medium high heat. 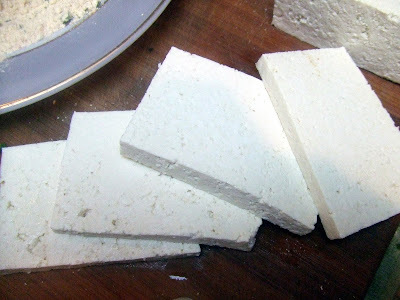 Cook the tofu slices until browned and crispy, sobre 4 minutos de cada lado. You may need to do this in batches depending on the size of your skillet. 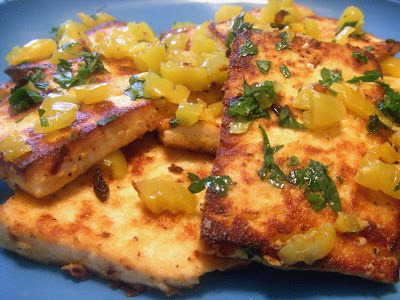 Remove the tofu from the skillet and set aside on a warm plate. Lower the heat to medium low and add the banana peppers to the skillet. Add the pepper juice from the jar along with the vegetable broth (add less broth if you want less sauce, more if you want more sauce). Melt the butter into the sauce. Pour the pepper sauce over the tofu slices. Decore com salsinha e sirva. It’s not the Tangy Cherry Chicken recipe that she has online though, it’s different. I’m going to look at the book when I get home, cause now it’s bugging me! You’re right about the recipes begging to be veganized. A little veggie broth and some seitan or tofu or tempeh… it’s really not even all that hard! I did the same thing. I got rid of most of my old cookbooks while building my vegan cookbook collection. I even got rid of a lot of my Rachael’s but then I realized I was getting rid of recipes begging to be veganized!! Thank you for the kind words and the warm wishes! Rhea, Perfect timing for your recipe post. I have a block of tofu sitting in the fridge & I did not know what to do until I saw your recipe. Will definitely try this out. You also triggered some thoughts on various ingredients for the sauce. Thanks much.